When my book club wanted to read A Christmas Carol for our December selection, I put up a fuss because I have gone through that plot too many times: I've seen Scrooge McDuck and just about every other version of that story structure. We picked another title and I decided to read Jason Reynolds' Long Way Down. Which, it turns out, follows the same idea as Dickens' classic. Ugh. At least it was a quick read. Written in verse, although not the best verse, I was able to get through the book in a day. Young readers will like how quickly they will be able to speed through it, and maybe getting visited by ghosts from the past will be novel to them. I'm sure it will be a popular title, I just wish I had read something else instead. 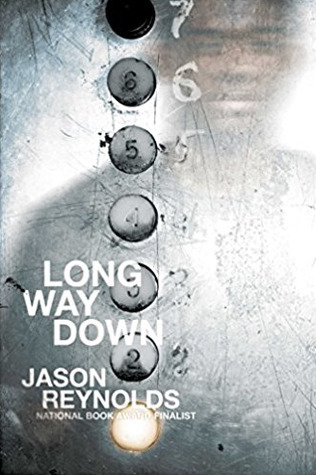 Long Way Down was just optioned to make a movie, which is interesting because the whole book takes place in the course of 60 seconds. I won't be seeing the movie, but I'm sure I'll hear from my students about how it is done. At my school in The Bahamas, the 4th grade does a unit on biographies and there is always a lack of titles about women. 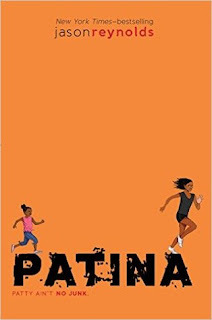 While there may be a dearth of middle grade chapter books in that category (especially in The Bahamas), there is a new crop of picture books that I highly recommend that those classes explore. Best of all, they are written and illustrated by women. I'm a Boston native but did not know anything about Bobbi Gibb, the first woman to run the Boston Marathon. 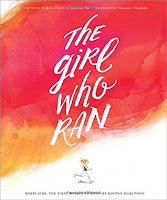 The Girl Who Ran by Frances Poletti and Kristina Yee has changed that. I loved this book and all the small details it shared about her courageous run. I hadn't thought about gear, but Gibb ran the 26 miles in a bathing suit and men's shoes, as proper sports equipment for women in 1966. It brings to mind the quote about Ginger Rogers doing everything Fred Astaire did, but in heels and backwards. The Girl Who Ran is ripe for discussion about bravery, equality, and barriers that still need to be shattered. It should be in every school library. 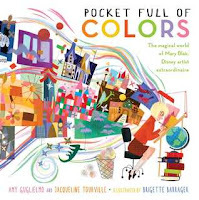 Another excellent picture book biography is Pocket Full of Colors: The Magical World of Mary Blair, Disney Artist Extraordinaire. In it, Amy Guglielmo writes about the first female illustrator in the Disney studios. Most famous for the "It's a Small World" exhibition at Disney World, Mary Blair spent her life collecting colors and making the world a more beautiful place. Throughout the book, there are so many color names I've never heard of before. The back endpaper has them written out in the appropriate color, a fun detail for readers to explore. Brigette Barrager's illustrations do justice to a book that is all about the majesty of color. I slowed way down to appreciate their retro beauty. Of the bunch, The World is Not a Rectangle is my favorite. 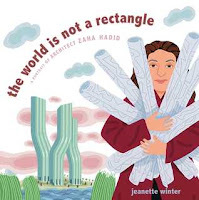 I had never heard of Iraqi architect Zaha Hadid, and Jeanette Winter's books inspired me to do more research to see photos of her work. What a revolutionary mind! I love how the author continually tied Hadid's inspiration back to nature, showing the buildings paired with their natural counterpart. Hadid's architecture looks like the future and many of her buildings have been added to my life list, thanks to this book.